When it comes to cookbooks is there anything better than sitting down and looking through a gorgeous book with great production values including a style that has obviously been thought through to the last detail and gorgeous photos of food? 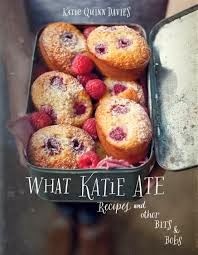 If, like me, you enjoy spending time flicking through such a book then What Katie Ate by Katie Quinn Davie might just be a book for you. I have included a photo of a page below to give you a small idea of the production values of the book. As an object, this is a gorgeous cookbook. You can feel the quality of the paper, there is a lovely black and white striped ribbon as a bookmark (I am a sucker for any book with a ribbon bookmark in it), the old style font and the photos come together beautifully. Katie Quinn Davies background was as a graphic designer in her native Ireland. 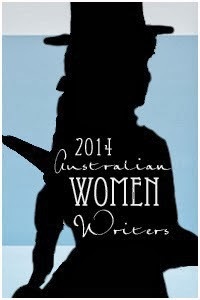 She moved to Australlia and eventually decided that she wanted a career change. After a few false starts she decided to combine her skills as a designer with her love of food. She started a blog and in due course this book was born. In answer to the question that I asked at the beginning of the post, the answer is yes, there is something better, and that is looking through a gorgeous looking cookbook that you will actually be able to cook multiple recipes from, and this is where I suspect this book falls down a little. You can tell from the way that she talks about food that Katie Quinn Davies loves food, but she loves more exotic flavours than I would nornally serve up on a day to day basis. 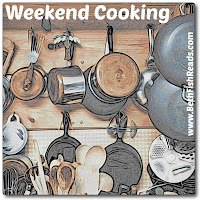 I also don't necessarily think that the recipes included are great for weeknight cooking. 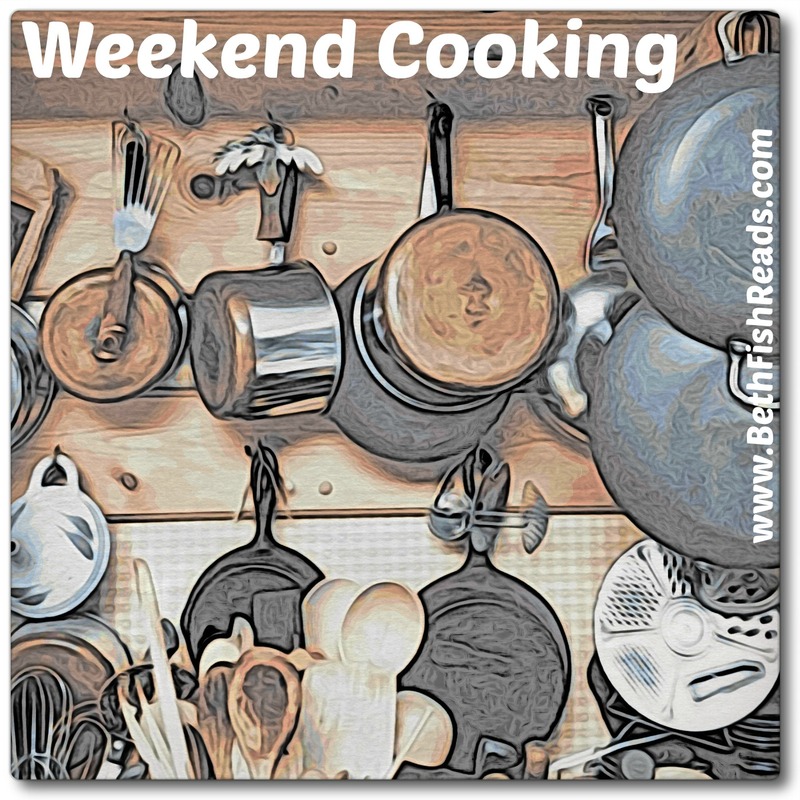 There is one recipe that she specifically said was a good weekday meal but when I looked at the instructions, it said that the cooking time was about an hour and a half. If I had to come home from work, do food prep and then wait for something to cook for that long I am pretty sure that I would probably faint from hunger and there would be an uproar from the other person who lives in my house. **Although it doesn't look anywhere near as easy as my normal chocolate cake recipe which I have posted before. I thought I would share a recipe from the book today. 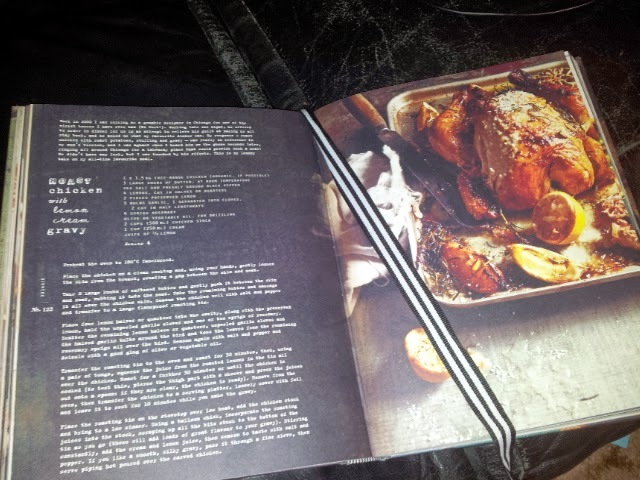 Over the last few months we have been cooking Bill Granger's lemon stuffed roast chicken and loving it. That is basically a chicken stuffed with a whole lemon and a bunch of herbs, which means that the chicken stays really moist. Because lemon seems to be my flavour of the moment, I was immediately attracted to the recipe for Roast Chicken with Lemon Cream Gravy, which seems like a next step compared to the chicken we have been cooking. I might try it next time I have guests over for dinner....maybe. Place the chicken on a clean worktop and, using your hands, gently loosen the skin from the breast, creating a gap between the skin and meat. Take 2 large knobs of softened butter and gently push it between the skin and meat, rubbing it into the meat. Take the remaining butter and massage it all over the chicken skin. Season the chicken well with salt and pepper and transfer to a large frameproof roasting tin. Place four lemon halves or quarters into the cavity, along with the preserved lemon, half the unpeeled garlic cloves and one or two sprigs of rosemary. Scatter the remaining lemon halves or quarters, unpeeled garlic cloves and the halved garlic bulbs around the bird and toss the leaves from the remaining rosemary sprigs all over the bird. Season again with salt and pepper and drizzle with a good glug of olive or vegetable oil. Transfer the roasting tin to the oven and roast for 30 minutes, then, using a pair of tongs, squeeze the juice from the roasted lemons in the tin all over the chicken. Roast for a further 30 minutes or until the chicken is cooked (to test this, pierce the thigh part with a skewer and press the juices out onto a spoon: if they are clear, the chicken is ready). Remove from the oven, then transfer the chicken to a serving platter, loosely cover with foil and leave it to rest for 10 minutes while you make the gravy. Place the roasting tin on the stovetop over low heat, add the chicken stock and bring to a low simmer. Using a balloon whisk, incorporate the roasting juices into the stock, scraping up all the bits stuck to the bottom of the tin as you go (these will add loads of great flavour to your gravy). Stirring constantly, add the cream and lemon juice, then season to taste with salt and pepper. If you like a smooth, silky gravy, pass it through a fine sieve, then serve piping hot poured over the carved chicken. I love this cookbook too!! Those slow roasted tomatoes were one of our favorite dishes of last summer -- try it now while you can still get farm-fresh tomatoes. It looks like a great cook book! I didn't have much luck with this cookbook, Marg. I got it because, well, it is SO gorgeous, and it looked very promising. But the recipes I have tried haven't been successful (one made me feel rather ill), and like you say, they are very complicated too. And your easy chocolate cake is definitely a lot easier than hers! I'm put off just by the ingredients list in Katie's (like I'm ever going to have fancy alcohol in the house!). My review's here.